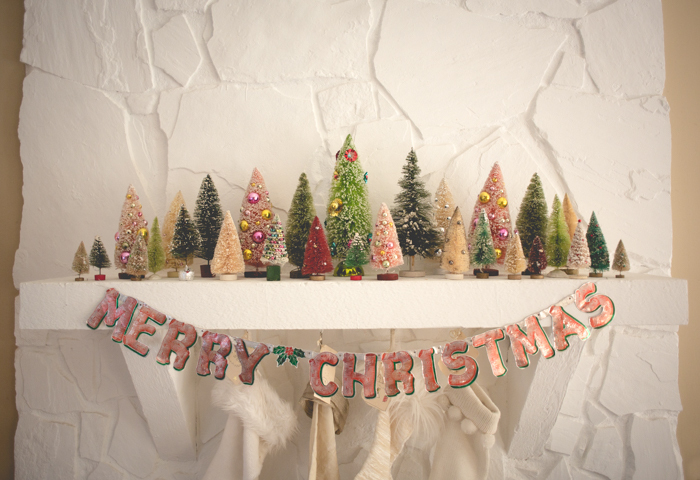 Andrea Corrona Jenkins, aka hulaseventy is sharing a few holiday vignettes from her Atlanta home with us today and we couldn't be more thrilled! Andrea, known for her colourful polaroid photography, also knows a thing or two about the art of display. Let's check it out shall we? Tell us about your photos? It's all about those happy little bottle brush trees! Which I've been collecting now for a long time. It started with a white one my mother gave me fifteen years ago-- it belonged to my grandmother and I sort of fell head over heels in love with it. Ever since then, I've been building the collection and try to add at least one new (er, old) tree each year. There are a few reproductions in there but the collection is mostly vintage. Doesn't really feel like Christmas around here til that little forest up there on the mantle! 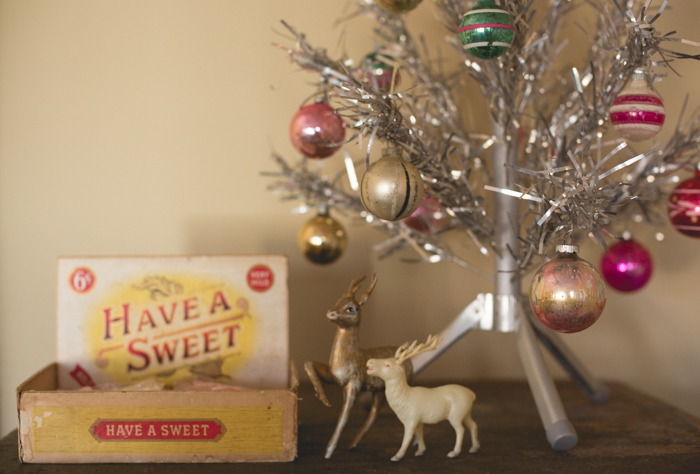 I have such a soft spot in my heart for vintage christmas. 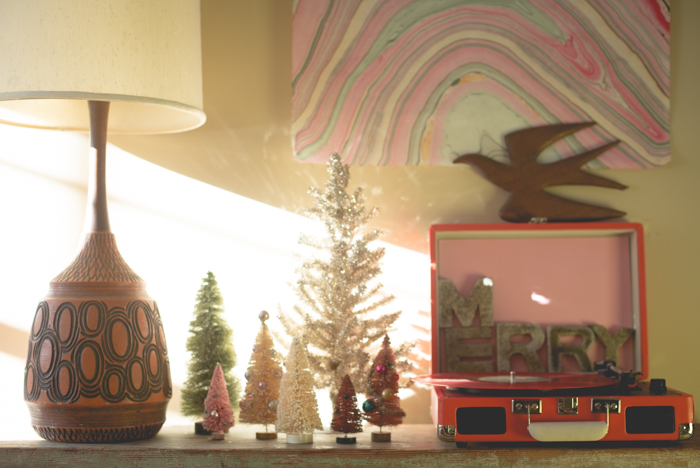 No matter what the trends are or how the look and feel of my home changes over the years, I'll always make room for quirky vintage christmas. oh, I love the advent countdown. It's something we started doing with the kids when they were just 7 and 3, and now they're 15 and 11! We count down the days til Christmas with a fun activity each day-- the kids find out what we're doing by opening a little envelope with the date marked on it. Some activities are really simple and small and some are more involved. I don't always start on December 1st (in fact, I find it really hard to start on the first) and, nine times out of ten, I end up changing a few at the last minute but no matter what, we always do it. Honestly, I just assumed the kids would lose interest as they got older but I couldn't have been more wrong about that. They are more into it than ever, and the challenge for me has been to keep to keep it fresh but classic. I try to add new activities each year, so that there are surprises but keep some of the ones that have become traditions. It's a fun challenge, though-- one I look forward to these next several years. I know this is something they'll always remember and I hope it's a tradition they pass onto their own children someday. Tell us of three go-to gifts you'll be giving this year! Beautiful home Andrea! Those bottle brush trees are how I first found you...one of your lovely images pinned on Pinterest. They are an obsession of mine as well...gotta love the vintage!